Donna Christensen, seen here at a 2016 Democratic rally, is working to pull party factions together.In 2016, it appeared that the V.I. Republican Party was self destructing, with different factions holding separate conventions and electing different officers and calling each other nasty names. In 2016, it appeared that the V.I. Republican Party was self destructing, with different factions holding separate conventions and electing different officers and calling each other nasty names. All that went away with the election of Donald Trump, putting one group in the driver’s seat. This year it is V.I. Democratic Party members going at each other. The prime issue to split the party faithful into two warring factions is the seating or non-seating of Kevin Rodriguez, as the senator-elect to the 32nd Legislature. The feuding, as was the case in last year’s Republican brawl, has resulted in a barrage of press releases and letters to the editor. The ruckus really got rolling after Democratic Party District Chair, Edgar “Baker” Phillips issued a June 15 new release. It reportedly called for Senate Democrats to leave the party if they had not voted to seat Rodriquez. Phillips statement, which the Source did not receive, reportedly said Sens. Myron Jackson, Marvin Blyden, and Jean Forde should no longer consider themselves part of the Democratic Party Executive Committee. Phillips did not deny sending the news release to certain media sources, but said it was not an act of retribution. Phillips and other Democrats are also concerned about elected senators passing a bill that removes the option of block voting for a party by just clicking on the party symbol. Democrats have a distinct advantage with this because the majority of Virgin Islands voters are Democrats. However, the issue is not going to fade quietly into history yet. 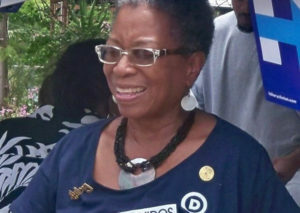 On July 3, the Democratic Party of the Virgin Islands and three of its officers from the St. Thomas- St. John District filed a complaint in the U.S. District Court to stop the Board of Elections from certifying and the Legislature from seating the winner of the April 8th special election – Senate-hopeful Janelle Sarauw. The opinion of the officers – Phillips, Glen Smith and Luis “Tito” Morales – is that there was no vacancy until June 28th, so the special election held prior to that was invalid. Christensen signed the news release that announced the filing. The fight over the whether Rodriquez or Sarauw should be seated is continuing at the Board of Elections. The vote on June 28 had eight senators voting not to admit Rodriquez while six voted to admit him. Sens. Blyden, Forde, Novelle Francis, Jackson, Neville James, Nereida Rivera-O’Reilly, Sammuel Sanes and Kurt Vialet – all members of the body’s Democratic majority caucus – voted against seating Rodriquez, a member of their party. Voting to admit him were Sens. Dwayne DeGraff, Alicia “Chucky” Hansen, Janette Millin Young, Positive Nelson, Tregenza Roach and Brian Smith – all members of the minority caucus except for Smith. On June 29 Jackson forwarded a letter to the board of elections informing the board of the Legislature’s action. On Wednesday, Arturo Watlington, chairman of the St.Thomas/St.John District Board of Elections, responded to Jackson’s letter. He wrote that he had another letter that informed him that the action Jackson was requesting – that the prevailing candidate of the April special election be certified as the winner – was not exactly the action taken by the Legislature, and the board would be considering all factors at its next meeting. Nice article about our local political party struggles and apparent self immolation that is on going for both Republicans and Democrats. The little that is remaining of the feckless VI Republican cabal refuses to come out from behind the rocks without fear or remorse and show any support for President Trump. However, to a moral certainty the fact that if Hillary Clinton had been elected, even with all her issues, the VI Democrats would all have joined on one big parade and put their differences aside. The one thing I got from this article is that the local Democratic Committee, or at least some of its members, would insist on supporting a party candidate despite his being a fraud. Is that the kind of people the Democratic Party really wants to offer us as senatorial candidates? It is fraud because he swore in legal documents that he was a resident of the state of Tennessee, while at the same time swearing that he was a resident of the USVI. One way or another it was fraud and showed a lack of integrity. “Party unity” is the poorest excuse for any action, and it is what absolutely turns people off of political parties. When are you going to figure out that public office is about representing US, the people, not YOU the political parries?